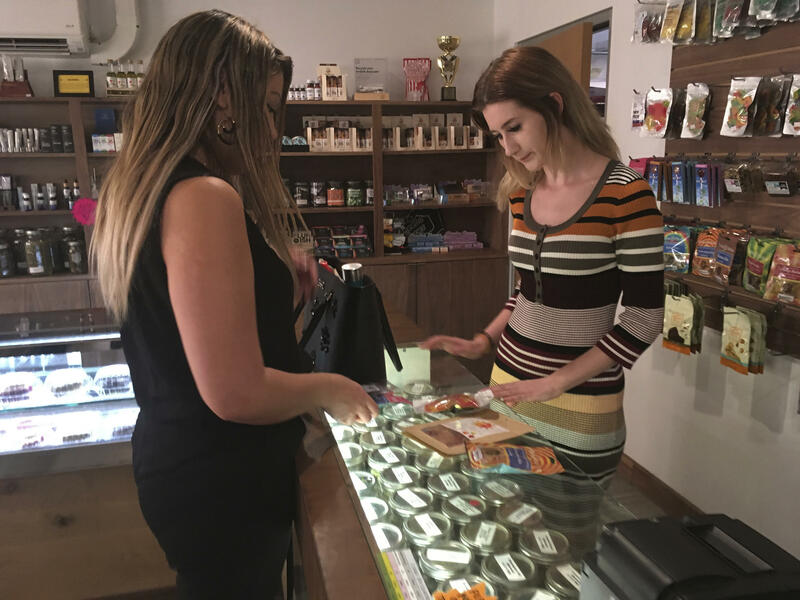 LOS ANGELES -- The arrival of the new year in California brought with it broad legalization of marijuana, a much-anticipated change that comes two decades after the state was the first to allow pot for medical use. The nation's most populous state joins a growing list of other states, and the nation's capital, where so-called recreational marijuana is permitted even though the federal government continues to classify pot as a controlled substance, like heroin and LSD. Matt Lucero, the owner of Buddy's Cannabis, said his store has stocked up on pot to make sure its doesn't run out of recreational marijuana during the first day of legal sales in California, CBS San Francisco reported. Lucero quit a job in corporate law to open a recreational marijuana store — the first one licensed in San Jose. "It feels amazing," Lucero said Sunday. "It's the culmination of years and years of hard work. We didn't push our way to first, we worked hard, hard long hours to get here." Johnny Hernandez, a tattoo artist from Modesto, celebrated New Year's Eve by smoking "Happy New Year blunts" with his cousins. "This is something we've all been waiting for," he said. "It is something that can help so many people and there's no reason why we should not be sharing that." "People might actually realize weed isn't bad. It helps a lot of people," he said. "We're thrilled," said Khalil Moutawakkil, founder of KindPeoples, which grows and sells weed in Santa Cruz. "We can talk about the good, the bad and the ugly of the specific regulations, but at the end of the day it's a giant step forward, and we'll have to work out the kinks as we go." The state banned "loco-weed" in 1913, according to a history by the National Organization for the Reform of Marijuana Laws, the pot advocacy group known as NORML. The first attempt to undo that by voter initiative in 1972 failed, but three years later felony possession of less than an ounce was downgraded to a misdemeanor. In 1996, over the objections of law enforcement, President Clinton's drug czar and three former presidents, California voters approved marijuana for medicinal purposes. Twenty years later, voters approved legal recreational use and gave the state a year to write regulations for a legal market that would open in 2018. "There's going to be a public-health cost and a public-safety cost enforcing these new laws and regulations," said Jonathan Feldman, a legislative advocate for the chiefs. "It remains to be seen if this can balance itself out." Jamie Garzot, founder of the 530 Cannabis shop in Northern California's Shasta Lake, said she's concerned that when the current crop dries up, there will be a shortage of marijuana that meets state regulations. Her outlet happens to be close to some of California's most productive marijuana-growing areas, but most of the surrounding counties will not allow cultivation that could supply her. "Playing in the gray market is not an option," Garzot said. "California produces more cannabis than any state in the nation, but going forward, if it's not from a state-licensed source, I can't put it on my shelf. If I choose to do so, I run the risk of losing my license."